Stunning view of lake and 8th tee & Fairway South Course. Nice renovations, entry to living area enlarged, pillars & crown molding added. Impact glass in terrace area. Kitchen with cherry wood extended cabinetry featuring bamboo trim. Black granite counter top, detailed tile and tumbled marble back splash, recessed lighting & under the counter lighting.Recessed lighting. Slide out cabinets for storage & spices. Matching paneled appliances. Storage galore. Built-in bar/hutch in dining area. Master bedroom dressing area with custom built-in wardrobes & higher vanity. Crown molding throughout. Guest bath has not been overlooked, features cherry vanity, detailed painted sink & granite counter top. 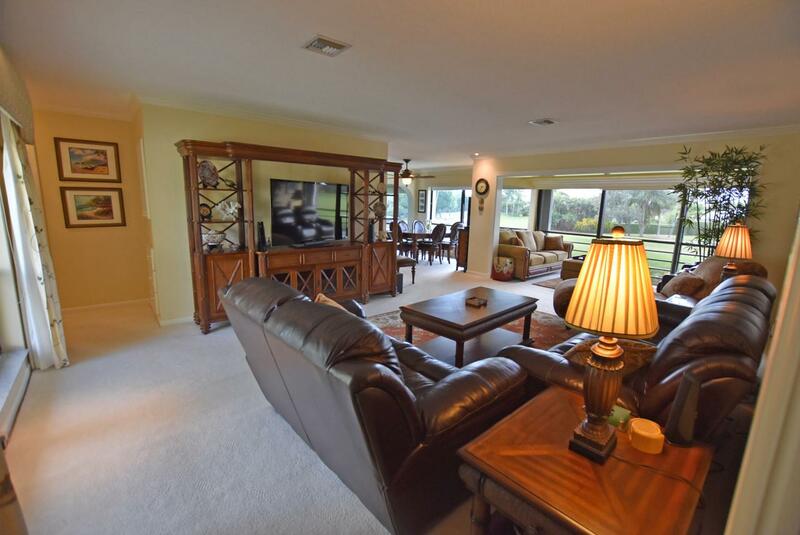 Surround sound & many built-ins.Offered fully furnished, Tommy Bahama style! Move in ready!New Clubhouse is Open! Mandatory membership. Quail Ridge is a private, member-owned community and club. All residents are members of Quail Ridge Country Club and have a choice of either a golf or a social/tennis membership.